When it comes to moisture intrusion restoration and repair, Barrier Construction has the expertise to handle all aspects of the repair. We work closely with the area’s leading inspectors, engineers and lawyers to help ensure and maintain the value of your home. Because moisture problems are often times hard to see at face value, we use third party moisture testing through certified firms to identify areas where moisture intrusion is occurring and how severe the damage may be. 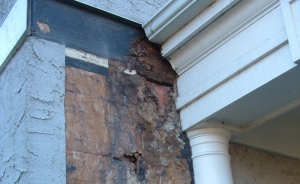 If ignored, it can seriously damage a home’s wood structure through rot and mold within the wall cavity. Depending on the needs and concerns, both non-invasive and invasive methods of testing can be explored to provide you with accurate information about any moisture intrusion issues with your home. Once inspection data is in hand, our experts’ help you decide which repair option makes the most sense for your specific situation and budget. At Barrier Construction, our repair experts know and understand the importance of quality craftsmanship, and we pay careful attention to the details. We take genuine pride in offering repair solutions that will help you maintain the lasting durability and beauty of your home’s exterior for years to come.